Unlike any dance show ever produced, Robert Sondergaard’s Reverse Collaboration project is a reversal of the typical production and creative processes—developing the lighting and environment design first and then adding in choreography as the final piece. The Reverse Collaboration concept is the culmination of MovEnt’s annual project called “Today in the Theatre” that brought choreographers and lighting designers together to explore lighting without the pressure of crafting a show. 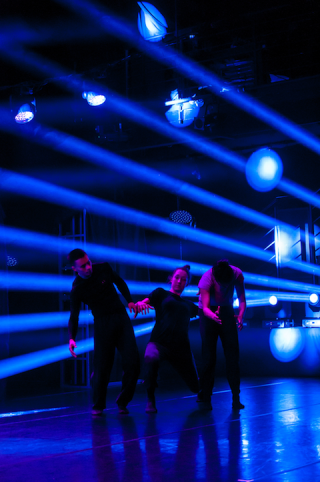 However, as Sondergaard, Owner of production design house Electric Aura, sought new ways to improve the collaboration process between lighting designers and dance choreographers, he felt the project needed to take the next step. In support of this year’s event, which featured the first ever dance show created entirely via Reverse Collaboration, HARMAN’s Martin Professional teamed up with Christie Lites to provide Sondergaard with a multitude of moving head lighting fixtures, including the MAC Quantum Wash and RUSH MH3 Beam. Dance professionals typically start with the choreography and add layers of lighting, sound, costumes and set pieces to enhance the production. However, these additional design elements are often forced to play catch up with the choreography to become a bigger part of the show and in many cases, the lack of time or monetary resources lead to designs that are not fully realized. By developing a show through reverse collaboration, Sondergaard, as the lighting and production designer, took the lead creative role. His process began by choosing a piece of music and then designed a lighting environment, with equipment provided by Martin Professional, Christie Lites, and Electric Aura’s own fixtures, that accentuated the sound. After months of developing the lighting design, Sondergaard then teamed up with two choreographers and four dancers at The Shadbolt Centre for the Arts in Burnaby, British Columbia to finalize the show over the course of six days. The first day consisted of load-in while the choreography was developed from days two through four. On day five the production team refined the performance and on day six the show was live. “It was an impressive feat by the choreographers to develop the routine in such a short period of time. While I had months to refine and fully program the lighting design, the choreography was only developed over three days,” said Sondergaard. Sondergaard deployed eight of Martin’s MAC Quantum Wash lights, with six on booms upstage and two additional fixtures hung in the air for top wash.